Seattle Health and Fitness Professionals: Is Your Conditioning Program Helping or Hurting Your Squash Game? Is Your Conditioning Program Helping or Hurting Your Squash Game? I have been in the fitness industry for over 14 years and witnessed people fall in love with squash everyday. Some people play squash strictly for the great workout while others to compete. No matter what your reasons are for playing, when beginning a conditioning program it is important to fully understand the demands. Squash requires the aerobic capacity to run and swing a racquet for 20-60 minutes, the flexibility to reach for deep rails and tight drop shots, and enough strength to forcefully start and stop while controlling a racquet. A good squash conditioning program should help strengthen your aerobic fitness, flexibility, strength, and mental focus. Stay off the sit down machines! In squash, you are moving in multiple planes of motion which requires balance, coordination, and activation of your core muscles. Using selectorized machines will prevent the activation of your core muscles and remove any balance or coordination. If your conditioning program consists of bouncing back-and-forth between seated machines you are training your body one way and asking it to perform in another (on the squash court). Use integrated movements that get muscles to work together rather than isolated movements that focus on one muscle working independently. In squash, you are lunging in multiple directions while swinging a racquet. This is an integrated movement of your lower and upper body. Your conditioning program should be as similar to the demands of squash as they can be. Doing lunges with rotation using medicine balls or cables is an easy way to integrate the muscles in your upper and lower body. Move in multiple planes such as forward and backward, side-to-side, and rotation. If your conditioning program consists of sitting on a stationary bike and seated machines pushing and pulling in one plane of motion then it is time to try something new. 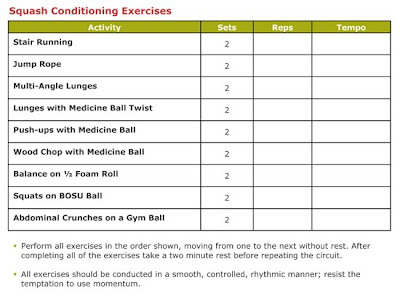 You do not need to get rid of all of your favorite exercises but try to add in some squash-specific movement patterns. Try lunges in multiple angles, cable chops from multiple angles, push-ups with one hand on a medicine ball. Get off the sit down bike and get up and try running some stairs or skip rope to increase your aerobic conditioning. Moving in these multi-planes will keep your stabilizer muscles running well and prevent pattern overuse all while making your conditioning program more “squash specific”. Starting Position: Start at the bottom of a set of stairs with multiple flights. Action: Run up stairs touching every stair. Walk back down the stairs. Maintain proper form by leaning slightly forward and striking each stair with the balls of your feet. Special Instructions: Progress to running every other stair. Starting Position: Begin with jump rope relaxed behind your legs touching the floor. Keep core tight and posture up straight. 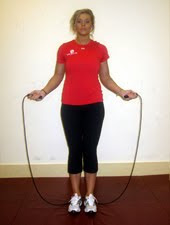 Begin by rotating the jump rope up and around your body while timing your jump with both feet at the same time. Try to stay on the balls of your feet. Special Instructions: Progress by changing your jumping action. Try alternating feet while you jump or even adding in two rope rotations per jump. Starting Position: Begin by standing in front of the step or riser (8-12 inches tall) facing forward. 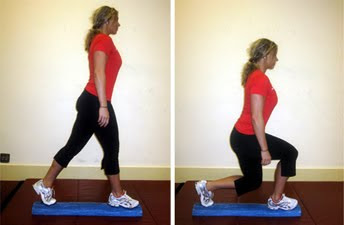 Place right foot in the middle of step and step up as you balance your body for 1-2 seconds on the right leg. Your left leg should be behind your body to help stabilize your weight as it is shifting. Step down with your left leg first and continue on down with your right. Try for 2 sets of 10-12 repetitions for each leg. Special Instructions: If you don’t feel comfortable with a riser or step height between 8-12 inches, start out at a lower height. Starting Position: Begin this exercise by standing upright while holding the medicine ball out in front of you just below chest level. Your elbows should not be locked. Step forward with one leg and lower your body to 90 degrees at both knees. Don’t let your knees go past the plane of your toes. Your thigh should be parallel to the floor at this point in the exercise. As you step forward, rotate your torso to the same side you step to (right leg forward then twist to the right) with the ball, keeping arms straight out in front of you. Push back to an upright position with your forward leg and bring arms back to the center of your body. Try doing 2 sets of 10-12 repetitions for each leg. Special Instructions: Progress with a heavier medicine ball. Starting Position: Begin by kneeling on a mat (not pictured) with your legs together, hands about shoulder-width apart and directly beneath your shoulders, and one hand on top of a medicine ball. Extend one leg at a time until you are balanced on the balls of the feet in the start ("up") position of a pushup. Make sure your abs are engaged and your body forms a straight line from the shoulders to the hip, knee and ankles. INHALE: Bend the elbows as you slowly lower your entire body--not just the chest--toward the ground. EXHALE: Straighten the arms and push back up to the starting position to complete one rep. After one set, switch the medicine ball placement to the other side to perform another set. Special Instructions: Keep your abs engaged and your spine neutral. Look at the floor about a foot in front of you to help maintain a neutral head and neck position. Make sure you are able to maintain a straight line with the body while lowering toward the floor. Don't lock out the elbows completely at the top. Only lower as far as you can in good form. Starting Position: Hold a medicine ball and stand tall with your legs straight, feet hip-width apart, hips centered and abs engaged. Keeping your lower body planted, twist from the waist toward the left and extend your arms overhead and toward the left side of your head (pictured). EXHALE: Keep your arms straight and your Feet planted as you twist your torso toward the right and lower your straight arms on a diagonal across the body and down toward your right foot, slightly bending both knees and pivoting on your left foot. INHALE: Reverse the movement, twisting your torso toward the left, straightening your legs and lifting your arms back up toward the left side of your head to complete one rep. Perform all reps on this side and then switch sides to complete on set. Special Instructions: Keep your arms as straight as possible at all times and relax your shoulders away from your ears. Pull your abs in tight to protect your back while you twist side to side. Starting Position: Lie on the mat, with your arms at your sides. Place your heels on the Stability Ball with your toes pointing upward. Raise your hips from the floor. Bend your knees and pull the ball toward you. Keep your arms on your sides and your hips off the mat while flexing your knees. Roll the ball out to starting position then repeat 10 times. Special Instructions: Tighten your glutes and core so you can keep your hips off the mat while doing this exercise. To make it more challenging, do this one leg at a time. Starting Position: Begin by sitting on top of the Swiss ball. Roll in the direction your head is pointed until your lower back is supported by the curve of the ball. You can either cross your arms over your chest or place your hands behind your ears. Do not put them behind the head or clasp them together behind your head. EXHALE: Crunch forward, using your abdominals, until you are at approximately a 45 degree angle to the ball. Keep you neck in a neutral position. Special Instructions: Keep space in-between your chin and chest, so your spine stays in a neutral position. Balance yourself on the ball with as much upper body weight off the ball as possible without falling over backwards. Starting Position: Begin by standing on ½ foam roll with one foot in front of the other about 10-12 inches apart. Keep chest up and core tight to maintain upright posture. Lower your body by bending both knees. Only go down as far as you have good control of your balance and posture. Special Instructions: Keep your core tight and posture up straight.